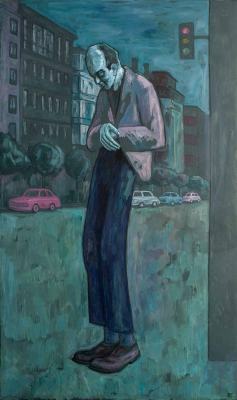 The squalid form of this homeless man is incorporated here into the perspective of a city street as if he were himself a kind of urban fixture, but abstracted and in stark contrast to his environment: outcast, excluded from the society of well-being and consumption, a figure of immense solitude. “Loneliness and the feeling of being unwanted is the most terrible poverty. There is more hunger for love and appreciation in this world than for bread” (Mother Teresa of Calcutta). “Yes, there is a thirst for meaning, for the things of above, for God. And in the West, more than in India, it is clear that our consumer society is unable to quench it” (Leo Maasburg, biographer of Mother Theresa of Calcutta).